The fourth in Brian Ganz‘s series of concerts at the Music Center at Strathmore traversing the piano works of Frederic Chopin was titled “Chopin, the Storyteller,” but Ganz has always been telling stories through Chopin’s music, stories that help to animate everything from the earliest mazurka to the most celebrated ballade. The 2014 installment of the series just put it in the title. Ganz addressing the Strathmore crowd on Saturday. Photo from his Facebook page. As always, Ganz provided some remarks from the stage that were stimulating if you knew Chopin’s music well and helpful to focus your attention if you were exploring the repertoire through this concert. Ganz found evidence of Chopin’s narrative gift in his music’s immediacy (especially as Chopin worked with shorter forms), pacing, and his courage to explore the darker places. Fair assessments all! Yet I was struck anew at this concert by the tension Chopin gets from ambiguity: the same phrase recast with a slight flicker in harmony that calls into question what’s come before, or a melody proceeding tentatively, doubling back on itself, unsure of where to take its next step. Ganz draws out these details, and it’s what makes his performances of works like the Mazurka in A minor, Op. 17 no. 4, so remarkable. I’ve rarely wanted to both sit in stillness for a minute and stand up and cheer like I did after Ganz played this music on Saturday. Ganz also keeps a sure rhythmic sense through all his careful explorations, which helped animate performances of the two Op. 65 waltzes that were somewhat slower than you often hear, and which made the Variationes brilliantes and the concert-closing Scherzo No. 4 as dazzling as the composer intended. It’s of a piece with his overall approach, which balances in-the-moment concentration and spontaneity with a keen feeling for the overall shape of the work. The most dramatic test of Ganz’s concentration and hold over the audience came in his performance of the Ballade no. 4 in F minor. As he wound up to a grand climax of fortissimo chords, he leaned back just a little, milking a pause. During the silence, someone in the chorister seats shouted “All right!”, sounding like Otto the bus driver from “The Simpsons.” The audience tittered, and suddenly the spell cast by the performance seemed fragile. Yet Ganz trusted himself and the music, playing five soft chords slowly, with a ringing tone, to bring everything back to Chopin. 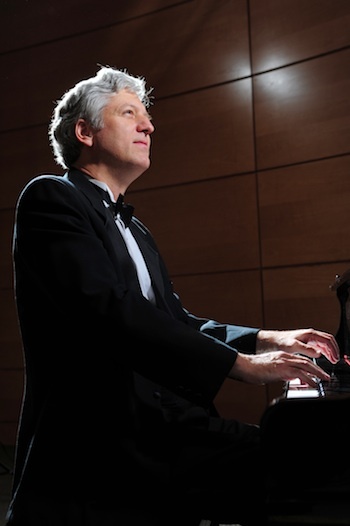 The National Philharmonic of Montgomery County, which sponsors Ganz’s series, will host Ganz on March 8 and 9 to play some more Chopin, specifically the first piano concerto. If you missed last Saturday’s concert, it’s another opportunity to hear an outstanding Chopin interpreter doing what he does best. The National Philharmonic has a commendable “All Kids Free, All the Time” policy that allows those from ages 7 to 17 to attend without paying. This has undoubtedly exposed many youths to inspiring music. On Saturday, it exposed the 7-year-old-looking boy in front of me to what seemed to be his worst nightmare, as incredibly antsy boredom in the concert’s first half yielded to desperate appeals for sleep in the second half, appeals only answered when he took it upon himself to go to sleep on the floor, to much murmuring from the adults who had dragged him to the concert. He remained asleep after the concert ended and he was picked up from the floor. The whole thing was remarkably distracting. I am not sure whether there are any larger lessons to be drawn from it, but it seemed worth mentioning. Brian Ganz talks about Frederic Chopin’s music as well as he plays it, and that’s saying something. 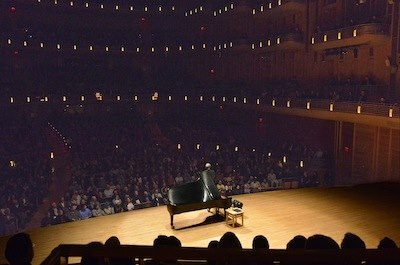 On Saturday night, in the third concert in his National Philharmonic-sponsored effort to present all of Chopin’s piano music, he once again showed how to use a microphone to reach out to a full Music Center at Strathmore and connect with every member of the audience, by telling stories, offering theories, and getting into the details of how to play this music. Classical concerts often sound like a wash of abstraction, where nothing feels particularly different than anything else; Ganz gave the audience some guidance on how to find its way through the program. Brian Ganz, looking as sincere as his playing. Presenting a couple of Chopin’s ballades for program balance, Ganz demonstrated his command of these larger-form works as well; harmonic incidents evolved into longer passages, and, just as he did in the miniatures, Ganz took pauses and hesitated or rushed forward in seemingly spontaneous ways that also contributed to the overall narrative feeling. Ganz told a story (also recounted in Anne Midgette’s excellent preview of this concert) about his experience listening to a recording of the first ballade, in G minor, as a young man and wondering “How can this be so beautiful that it hurts?” His rendition ran the gamut, with the final chords returning to G minor and ringing out from the bottom of the keyboard like cannon fire, shattering the tenuous peace that had obtained earlier. 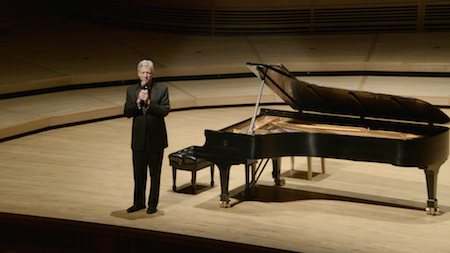 This inspired a standing O from the audience – common enough at the end of a program, or even at intermission, but less so when there’s still music to be played, and a testament to both Ganz’s discussion and his performance. After intermission came the Op. 28 Preludes, the summa of Chopin’s miniature art, presented as one continuous string of 24 pieces, with no pauses for applause. Before sitting to play, Ganz spoke about the challenges and possibilities concision presented to Chopin – editing his fertile imagination to gestures and thoughts that provide a glimpse of a world, leaving the mind to contemplate what’s left unsaid. Ganz’s playing captured that sense of wonder: I got images of a limpid brook rippling, but faintly disturbed; a storm sweeping by at a distance; a sunny field; a cool marble temple, quiet and implacable. But Chopin’s careful counterbalancing of the preludes, with contrasts propelling the sequence, gave an extra dimension; Ganz wove the overall tapestry of Op. 28 with just as much attention to the overall sweep of the music as he did the individual preludes. A world made of small worlds can have a large impact indeed, and it did on Saturday night. I’m already saving February 22, 2014, for the next installment. Other People’s Perspectives: Grace Jean. Well, not really; my fiancée had to point him out to me. I cannot recognize anyone. But in case you are wondering where to get your paparazzi photos after next year’s concert, I’d try Silver Diner. Rockville Pike baby! How many high-school nights I idled away at that business’ previous location on Mid-Pike Plaza. Of course, now their menu is so high-falutin’ that high-school me could never have afforded to eat there, but such is the ever-downward march of gustatory luxury. What were we talking about again? I don’t know how many classical concerts I’m going to get to review over the upcoming months, given my impending nuptials and various job-related things. But I’m glad I got to go to this one. Saturday night brought the second concert in Brian Ganz‘s ten-year Chopin Project, in which he will play all the piano works of Frédéric Chopin at the Music Center at Strathmore, with assists from the National Philharmonic, the project’s co-presenter. Annapolis resident Ganz opened with the two polonaises of Chopin’s Op. 40. I’ve never much liked the first, the A major “Military,” which seems to be composed primarily of ringing gestures with little music in between, and Ganz romped through the chords that makes the piece, admittedly, a good concert opener without seeming to solve the boredom problem. It would turn out to be the only less-than-stellar performance Ganz gave in a truly satisfying evening. In the second, C-minor polonaise, Ganz made the ruminative opening motif sound like a riddle and spent the rest of the polonaise methodically teasing out an answer, all while the dance rhythm pulsed clearly under the rest of Chopin’s invention. Quiet passages shimmered with color; more forceful passages rang out and filled the Music Center. Ganz didn’t use a lot of rubato, but he picked his spots well; he seemed primarily concerned with realizing his conception of the music rather than imposing an idea upon it. His judgment and precision gave the whole thing an irresistible musical momentum. Brian Ganz, playin' it. From his website. Then Ganz picked up a microphone, welcomed the (large) crowd, and told us what he’s up to with the Chopin Project. Without notes, he discussed eloquently the “mysterious soulfulness in Chopin’s music.” Sometimes he adopted the cadences and impassioned tone of a preacher, and as people who had just heard him testify at the piano we were ready to hear it. The occasional discussions helped the audience understand what the piece meant to Ganz, making the subsequent performances more vivid for the understanding. 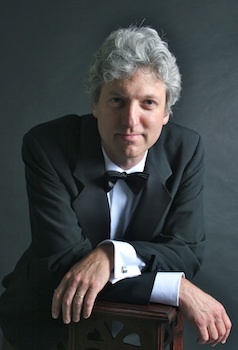 After the discussion of “mysterious soulfulness,” Ganz brought out just those qualities in the Fantasie in F minor, which ended with a ravishing, suspended-in-midair coda that, in Ganz’s hands, seemed to hint at some redemption from the turbulence that had preceded it without necessarily promising anything. Before the Waltz in A-flat major, he took the time to explain to the audience the joke of the two-beat rhythm in the right hand against the waltz rhythm in the left hand, and how Chopin embroiders them together with additional melodic filigree; Ganz then made it all sound smooth, with the wit clearly audible but balanced with the other delightful aspects of the music. The program as a whole was balanced nicely as well, with big serious pieces like the polonaises and the Fantasie spelled by smaller works that were at least less demanding for the audience. These produced some highlights too. Ganz showed a facility for navigating the finger-twisting runs Chopin so often demands, especially in the Fantasie-Impromptu in C minor, where the notes cascaded cleanly as a brook in springtime. Four mazurkas from Chopin’s Op. 6 received strongly rhythmic performances, in which melodies sounded forceful even when they weren’t loud thanks to their emphatic phrasing. The Polonaise-Fantasie, Op. 61 and the Andante Spianato and Grande Polonaise Brilliante sandwiched the mazurkas on the program’s second half. Giving the audience a chance to trickle in from intermission, Ganz introduced the Polonaise-Fantasie by musing on the idea of the word “fantasy,” likening it to “dreaming along with Chopin,” and then revealed that the P-F once had little appeal for him before discussing how he had come to esteem it highly. This little lecture gave the audience an out in case they didn’t quite get the work and a frame within which to apprehend it; Ganz’s performance embodied the idea of “dreaming along with Chopin,” in which the snatches of dance rhythms became ideas for rumination and reflection before transforming into something more. For the Andante Spianato and Grande Polonaise Brilliante, Ganz disclosed the traditional music-school reduction of its name, “Al Dente Spaghetti and Bland Mayonnaise,” and prefaced his discussion of the Polonaise by saying, “The word ‘fun’ is underrated in classical music.” After a magical, liquid Andante, he proved his point with a Grande Polonaise that swaggered, crashed, boasted, and generally made a ruckus. At times, Ganz seemed to have fun pushing until the music was barely in control, like a driver accelerating hard into a turn and holding onto the grab bar, but of course we were never actually in any danger, just having a ball. First Ganz told us, then he showed us. I look forward to hearing him do it again in the next Chopin Project concert on January 19, 2013. The crowd whooped it up when Ganz first came onto the stage, and applauded after the “Military” Polonaise even when they were listed without a gap in the program, which is cool. But then Ganz took a pregnant-pause moment during a transition between sections in the Fantasie — never removing his hands from the keyboard — and applause broke out that took way too long to silence. Credit to Ganz for maintaining his equanimity and continuing a brilliant performance. Ganz would not have been affected, presumably, by the extremely ripe-smelling person who was sitting near me, but I got strong whiffs at various points throughout the concert. In case you are wondering, I definitely suggest that people shower on concert days. Finally, the garage at the Grosvenor-Strathmore Metro Station, which serves as a place to park for the Music Center, was a total nightmare to get into and out of on Saturday night. Just saying. I’m guessing the problem with exiting was related to people emerging from the garage, seeing our in-progress dusting of snow, thinking “Oh [expletive]!” and being momentarily unable to drive as they contemplated the terrible, terrible sins that must have brought a fate such as late-nite wintry precipitation upon them.